#1 son is feeling fine now and thanks you for all your concern! Pretty! Glad to hear your son is feeling better! Wow! 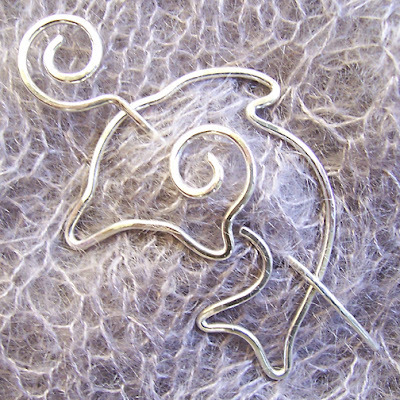 The dolphin pin would go great with the Dolphin lace scarf from Victorian Lace Today! I love to see those new designs show up! Pretty! Rosemary- they're exquisite. I need to make a shawl worthy of your craftmanship. Those are awesome!!! I love them!!! I just love the new shawl pins. I think I just put in an order for a 'special' pin didn't I? Now, I need to get busy and knit some lace. The shawl pins are stunning! Those are so beautiful, especially the dolphin! Glad to be back, Rosemary--smooches to you! 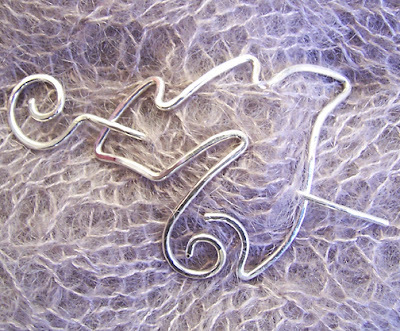 Your shawl pins are fantastic! Do you have an etsy shop? These are amazingly gorgeous! Glad to hear that your son is feeling better! That's amazing! I can't even imagine how you do that. Those are beautiful! You're very talented! On another note I hope you son feels better! Those are beautiful pins. I really love the dolphin one. It's so perfectly evocative. Wow - those are both just lovely! If my dolphin lovin' daughter had discovered shawls yet... ;-) I'm working on her! Just beautiful!